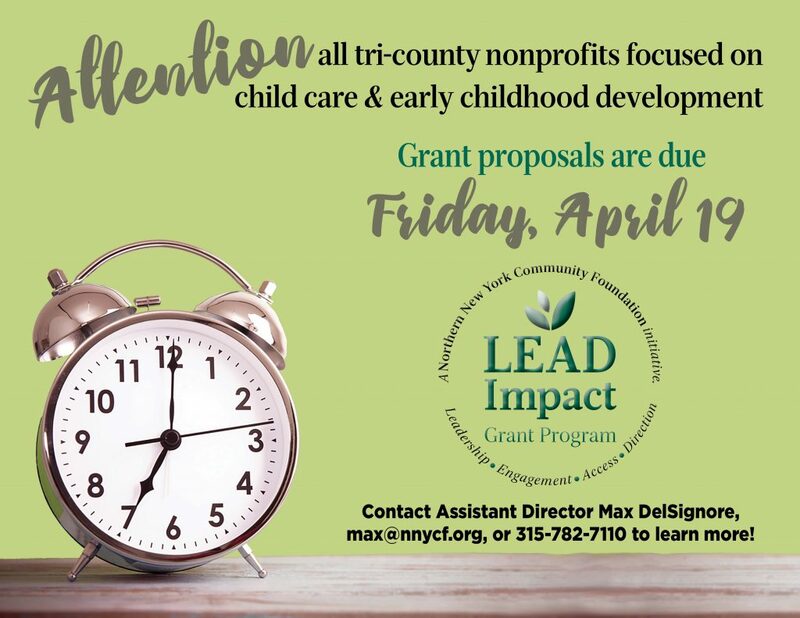 Eligible nonprofit organizations whose missions, programs and services target child care and early childhood development are encouraged to apply for funding through this grant opportunity by Friday, April 19. Grant-making efforts to address this strategic focus will target four areas: programs, advocacy, accessibility and opportunities to support staff through training and professional development. Nonprofits that wish to apply must have confirmed charitable status as a federally recognized tax-exempt organization. Other publicly supported organizations, including school districts and municipalities, are also eligible and encouraged to apply. Eligible nonprofits must actively serve residents in Jefferson, Lewis or St. Lawrence counties. The Council will review grant applications through the spring and summer and announce awards in September. The LEAD Impact Grant Program is made possible thanks to generous support from the Hyde-Stone Charitable Foundation at the Northern New York Community Foundation, BCA Architects & Engineers, Carthage Savings and Loan Association, and donors to the Friends of the Foundation Community Betterment Annual Fund.